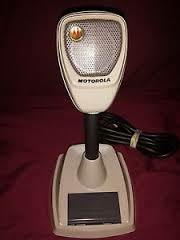 I have an old, but very good quality Motorola microphone I bought years ago that is just collecting dust. It was at one time set up for a UHF or VHF (someone once said it was popular with police departments)radio, but I had a friend that worked on C.B's change it to work on a C.B by putting in a switch out of another desk mic. It is almost like a power mic, even though it isn't. I'm pretty sure it's a dynamic and around 135 ohms. I was thinking about connecting it to a mono 1/8" plug and using it like you would on a radio. I would imagine the computer has enough power to support the mic, but not certain. What do some of you guys think? I not only want to use it due to it collecting dust, but to remember my friend, as he passed away about a year-and-a-half ago. He would be happy that I found another use for it. Maybe Motorola Man might be able to tell you if you were to put up the model number. Our silver book went missing a few years ago so I can't tell you. It's a Motorola Motorola tu532a-1. I pulled a photo from the web, so you can see what it looks like. I'm not sure about connecting a mic directly to a PC, but I use one run thru my Pioneer SX-1050 first, then to the PC. Mine is an old RCA, but I can't remember the model number right off hand. I'm guessing you put it through the receiver first because the receiver acts as an pre-amp, right? I've read that it might require a pre-amp to boost the signal, but almost every pre-amp i've looked at on ebay is way too expensive, except a little phono pre-amp, which I would imagine it would be large enough to boost a microphone signal. While researching this, I came across a webpage where a guy destroyed a D-104 and an inexpensive computer mic. What he done was put the cheap condenser mic element in place of the dynamic element of the D-104. I wanted to slap the guy silly.. those mics are getting harder to find and expensive. I use it for a pre-amp and also because I know the output is compatible with the computer. I would bet that you will need a pre-amp of some kind. My PC is connected to the receiver by a tape out jack. I assume that the output is "line level." I would think that if the pre-amp delivered a signal similar to that, you should be fine. I don't know enough about the sound card in a PC to advise you further. Out of curiosity, have you tried it with no preamplification? Thanks for the info WC.. 75, I have not tried it yet. I have yet to get a mono 1/8" plug and a 5 pin din plug, as I have one in an old CB with a bad so-239 connector. I'm planning to keep the mic cord in tact. I would've thought a dynamic mike would have some output signal. It never hurts to see whether you can save the expense of an extra you might not need. Most PC's have three 3.5mm jacks. The green one is headphone, but it can be amplified. The blue one is line in and the pink one is mic in. It should work with any hi or low impedance dynamic or crystal mic. If you only have the blue then you need a preamp. Parts Express has a couple of mic amp boards. One is the 320-204. This is only a board, no power supply, no mic input. Just a chip and a control. But think how much fun it'll be putting the whole thing together. I have a 1 year old Gateway laptop and it only has the headphone and an auxiliary input. They are both black and not color coded like on a desktop. I'm guessing the auxiliary input is the same as a line in on a desk top. I know the mic works when plugged into a mic input, as I plugged it into my mom's desktop. It seemed a bit sensitive but worked. I totally forgot about Parts Express, as it's been awhile since I've bought stuff from them. I'll have to check them out and see what I can find. Thanks. look very closely. There might be a tiny symbol around the jacks. My HP laptop has an engraved mic and headphone, also black. If I weren't looking for them I'd probably miss them. Most modern computers have only mic and headphone jacks and no line in, for programs like Skype. Anyway- be very careful putting the cable on the plug. The cable is very large and that plug is REALLY small. Personally, I'd replace the mic cable with something smaller. P.S. That really is a cool mic. It has a symbol by it that looks like a mic, but in my audio properties it shows it as an internal aux jack. I just put some good batteries in an old radio shack condenser mic that was designed for a computer, and plugged it in the aux port. It worked like it should. So, apparently the aux jack requires a mic that is powered. It looks like I will be getting that pre amp board from parts express sometime. I'm just curious if that would operate with 9 volts, rather than 10+ volts? As it would be easiest for me to use a 9 volt battery or a 9 volt power supply, as I have quite a few floating around. I didn't see you other posts. My computer is odd and only has the line in(basically). It works for an amplified mic. I plan to leave the 5 pin din wire on the mic, as I already made a make shift adapter for it. When I get the pre amp from PE i'm going to order a proper mono connector for the mic and make it neater. I'm also going to order a 9 volt battery snap and a 2 AA holder, and just run it off of batteries, that way I don't have to plug it in. Also going to get a box, toggle switch and LED for it. Everything is just under 23.00, with shipping it will be just undef 30.00. It will be a fun little project. I bought that mic for 10 or 15.00 at Fair Radio Sales probably 3 or 4 years ago. Sounds like fun- Keep us posted. FYI- There is another place where you can get neat fun projects. Ramsey Electronics. That's where I got my FM transmitter. Here's a video of what I did with one of the amp chips. It's hooked up to my computer and sounds great. It will be awhile, but i plan to do it. I'll have to check them out. If I get a transmitter, it would be an AM, but they are a bit too expensive for me. I watched your video a few weeks ago when you posted it on here. That actually looked a bit complex at first, but after looking at the pre amp board it looks like something I could do. I would love to build a decent amp for my computer but i'd want to get rid of all my computer speakers first. tuberadiogeek wrote: It will be awhile, but i plan to do it. I'll have to check them out. If I get a transmitter, it would be an AM, but they are a bit too expensive for me. I watched your video a few weeks ago when you posted it on here. That actually looked a bit complex at first, but after looking at the pre amp board it looks like something I could do. I would love to build a decent amp for my computer but i'd want to get rid of all my computer speakers first. If you get an AM transmitter from Ramsey get the synthesized, NOT the tunable. However if you're serious I think some of the other members would agree to get the Sstrand. Remember that the Ramsey is a kit. I think the Sstrand is too. I don't know about you but I LOVE putting kits together. I wish I could get a job assembling kits. The most complex one I did was the Heathkit oscilloscope. I was looking at one on Ramsey for 35.00, I believe. I know SStrand and talking house are about the best transmitters to get, but I would never use one that often. I've never really put electronic kits together except in high school. We did AM/FM radios, but I think the kits were low quality. The boards were crappy too, the traces for solder points would get damaged easily if you made a solder mistake more than once. Once they were damaged you couldn't solder any more. I still have it, only the AM section worked. The FM section worked but the tuning coils got damaged. DO NOT get the $35 transmitter. Period. You will be VERY disappointed. Trust me. Save up. If you feel uncomfortable putting together any kit I would be more than glad to help. I'm not getting a transmitter anytime soon, when I'm ready I'll post here for advice. However it looks like i will be ordering the mic pre amp kit tomorrow. P.E sent me an email with a promo code to save 5.00 on my next order of 25.00 or more. Which will take care of most of the shipping cost. I do have a question regarding the LED I want to use as a indicator lamp. I used an LED calculator online and it said to use a 560 ohm to bring my voltage down to 2 volts and current to 20ma for 12 volts. I was thinking about running the LED at 15ma of current which calls for 680 ohm since i'm using batteries (1 9 volt and 2 AA) and don't want to put too much of a strain on the batteries. Would that still be bright enough? Then I was just thinking about operating it off of 18 volts(9 volt x 2) since it can use 10-30 volts. Which would call for an 820 ohm resistor. That would bring it to 17.5 ma of current.